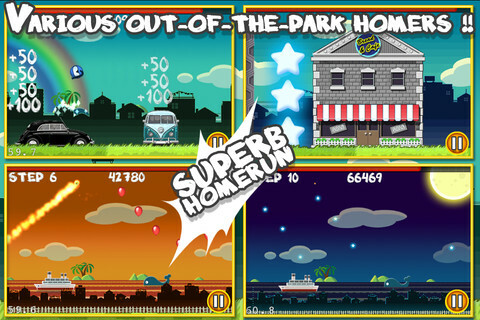 There’s nothing shockingly new about Flick Home Run!, but when it comes to fun factor this high flying batting game knows how to hit it out of the park. The game’s cool color palette and casual pace is so appealing it will remind you of the smell franks on the grill as the warm breeze of summer hits your face. 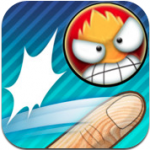 The developers at Infinity Pocket have mastered a feeling, and their game you will master the art of the home run. 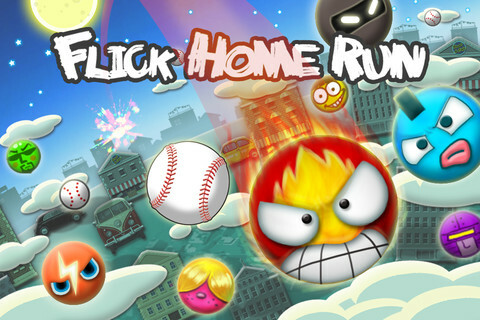 Flick Home Run! starts with a clear and concise tutorial showing gamers the ropes. Press the “Pitch” button on the lower part of the screen and and a red light will shine in anticipation (real life batting cages regulars will recognize this right away). Then the pitch comes in. 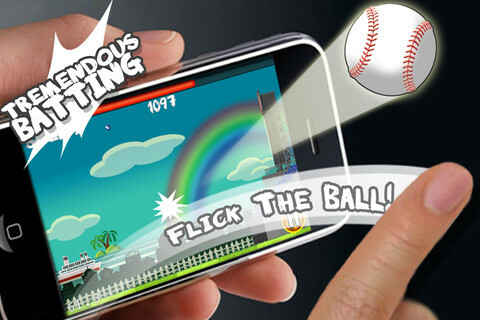 Wait for the ball to cross the vertical dotted line halfway through the screen and give it your best flick (aka swing). If you fail to hit the ball past the dotted line (Flick Home Run’s version of a foul ball) or miss entirely, it’s an immediate out. Hit the ball long and far on the other hand, and you have a chance at a real home run. The goal is to get as much distance out of your hits as possible before the game ends, but what’s really impressive is the physics engine that powers Flick Home Run!. The pitches themselves vary from fastballs, mystery pitches, change ups, and rises. Every round you get a couple peaks, but you must use them wisely or else you’re hitting blind the rest of the game. Hit on top of the ball and you smash it into the ground, but drop your finger and miss under and you’re condemned to a high, distance-less pop up. If you get lucky you’ll hit a few balloons in the sky, but home runs don’t come easily at first. 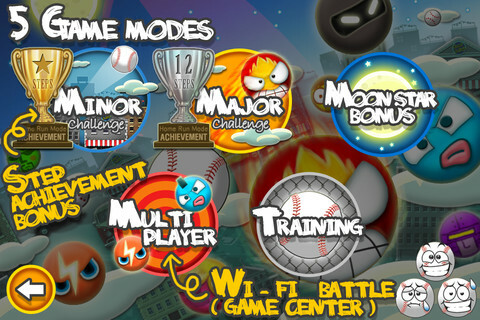 In fact, I’m convinced you need a few power ups before the home runs start raining down. Power ups can be earned through experience points or bought through the store, but regardless of the route you take, the more you play the more addictive Flick Home Run! gets. The premise is as simple as it gets, but there’s just something undeniably magical about hitting hitting it out of the park. Bottom Line: Flick Home Run! tests finger-eye motor skills to see if you have what it takes to hit it out of the park. Summery and cool, this casual game will fulfill that field feel until Spring hits and baseball season returns.